Want to accept payments via PayPal as well as using a normal merchant facility to accept credit and debit cards? Since over 20 million UK online shoppers use PayPal, it's easy to see how you could be cutting out a big slice of your sales by not accepting it as a form of payment. 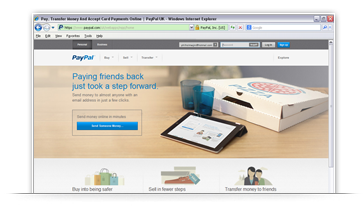 In fact, according to a recent Payments Council report, 19% of all UK internet payments are now made using PayPal. With our Solution Two account PayPal Express Checkout is included as a payment option with your account as standard and this makes life simple - no separate integration to PayPal is needed. With our Solution One account it is part of the hosted payment page API and the silent post option. PayPal Express Checkout makes it quick and easy for your customers to pay securely with a few clicks. PayPal payments are not available with our mail and telephone order service or Recurring Payments. There are no additional set up charges or transaction service charges but standard PayPal charges apply. Refer to PayPal Transaction fees for domestic payments. This service is only available to merchants in the UK. By accepting PayPal transactions through your account, not only do you open your store to more shoppers; you also get the added benefit of being able to view your transactions in one place. 4 or more payment types increases the success of a transaction by 22%.